I am at a total loss as to what is going on with the weather at the moment. 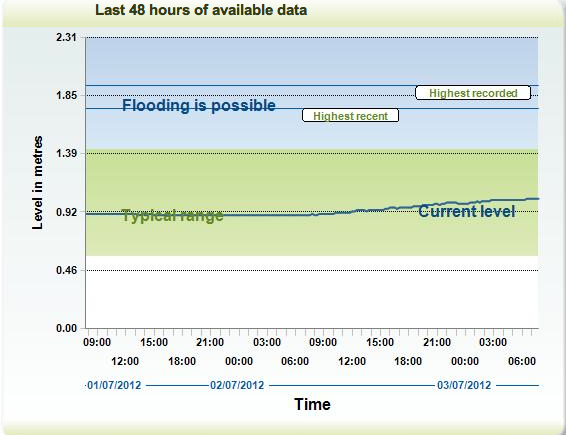 The river has been up and down like a yo yo! I managed to get out for a few hours on the Monday after the heavy water stopped fishing on Sunday. The river was still coloured but dropping. The only excitement was a clean fish in the low teams coming to hit the spinner at my feet. I did what anyone would have done in the circumstances and jumped out of my skin, pulling the spinner out of the way prior to repeatedly cursing! On Sunday morning Tony and i arrived early and were full of hope as it was one of the rare occasions where everything looked perfect. 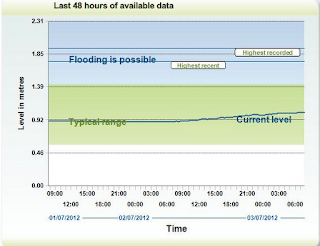 The water had dropped to .96 on the gauge at East stoke and had about 3' of visibility, it looked very 'Fishy'! We fished down to the bottom of the beat and worked our way up to the hut for some breakfast. We are surprised not to have seen anything. We expected that in the conditions we may have connected with a Sea Trout. After coffee we worked up to the top of the beat, again, we were met with no success. After Tony left i fished on until about 1.30 but didn't see even any signs of a fish. I decided to call it a day and headed off home as we planned to visit friends in the afternoon. Having seen the terrible weather forecast I'm not feeling optimistic about the next couple of weeks. 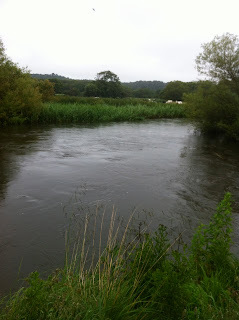 I took the dog for a walk this morning and the river is up and dirty again!!!! Looking back on my diary from last week i was surprised to see that up until the end of June last year I'd only had 4 fish despite ending the Season on 21 so maybe there is hope yet! its spring tides today so maybe that will bring in some fish but i feel with the continued high water we are going to be lucky if the fish hang around the bottom beats. Fingers crossed for a more productive July!